Diaper rash. It seems like we’ve all been there. Sometimes figuring out what caused a rash, how to treat it and how to make it go away permanently can take research and time. One often recommended/universal treatment for diaper rash is airing out the bottom. For this parents are often told to allow little ones to go diaper-less, exposing a rash to fresh air and light that helps cure those adorable little bottoms. MoonMaker Diapers are parent developed and pediatrician recommended cloth diapers that help air that bum out…while collecting pee that would otherwise wind up on the floor, furniture, bedding or right on baby! 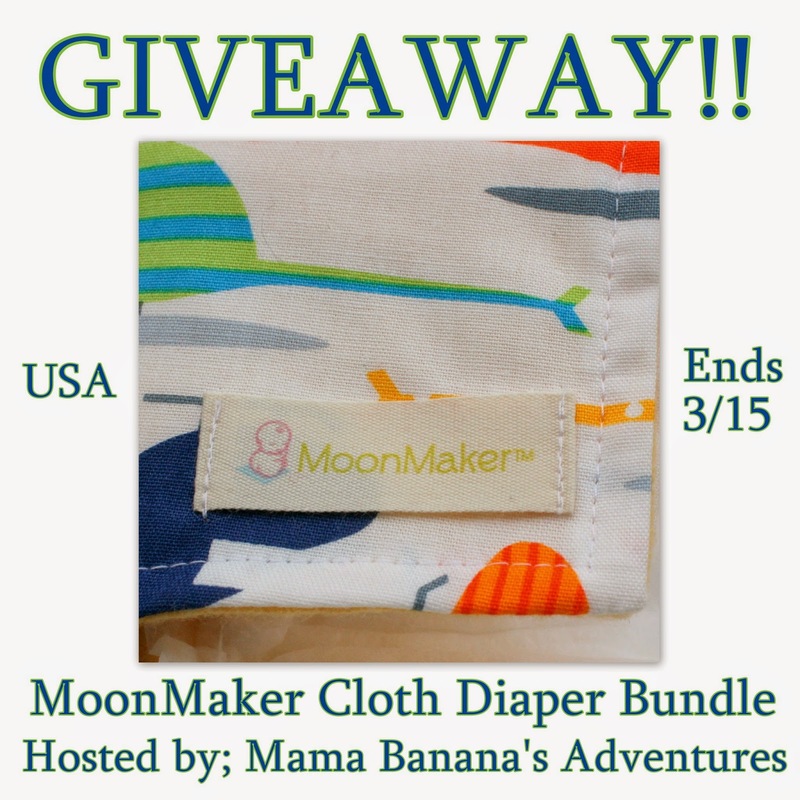 Take a look at some great photos and get the story on these unique and pretty ingenuous diapers in Mama Banana’s Adventure’s MoonMaker Diaper Review and enter to win a set below!! reusable. Awesome right?! Please enter below and thanks for stopping by! Don’t forget there is more to win on the sidebar and home page. We have a great giveaway called Daylight Savings Giveaway and Spring Is Here Giveaway on my home page. This post does not make any health claims, as always please refer to your pediatrician for health related issues as the internet is not a good place to diagnose or treat any condition and when it comes to babies and toddler, best to be cautious and refer to a medical professional. These sound amazing! Great Product Review! I like that it allows an alternative to no diaper when a rash develops once a little one is a bit further along in potty training.